Edison Pen Co – Edison Offering Richard Binder 14k Full Flex Nibs! I’m very happy to announce a collaboration between Edison and Richard Binder. We will now be offering fully flexible 14k nibs. These nibs are awfully impressive. 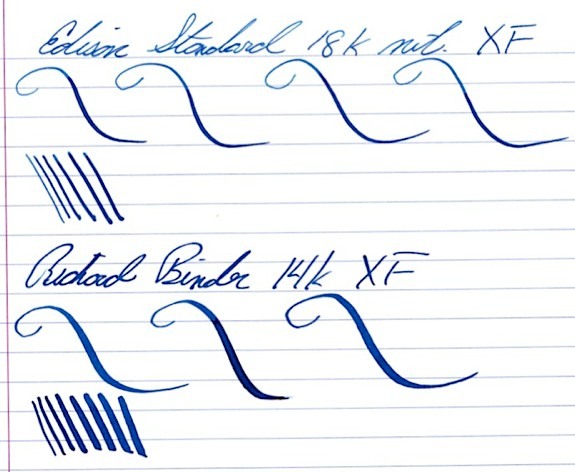 As you can see in the video, there’s little difference between the vintage flex nib and Richard’s work. Actually, Richard’s nib is offering a bit more flex. Pricing is as follows (this is the cost for the flex alteration only…the cost of the pen including the 14k stock nib is in addition to this cost). Please note – as per our agreement with Richard, we cannot sell individual flex nibs. Only equipped on an Edison Pen. If you are not familiar with flex nibs, I would recommend visiting Richard’s site to read a bit about proper care of flex nibs. That nib looks great Brian, you and Richard did a great job! Is there anyway to see the line size for other nibs (F, M, B)? At this point, I would only worry about F, and Finer. Most people don’t want an M or B flex nib, as this reduces the line variation, which is the whole reason for doing flex. Also, I usually don’t even order these nibs in M or larger, as there’s just very little demand for them. I am really interred in getting the fine 14k full flex nib for my Collier (Awesome Pen) where can I buy it since I haven’t been able to find in the page nor in your distributors a way to do it. Thanks keep up the amazing job!! Thanks! If you want a fully flexible nib, you can buy them direct from Richard. We don’t sell them individually. Here you go…. Thank you for offering this fantastic flex nib customization by RB. I can see there are more than the usual FINE option. XF, XXF, and XXXF are offered at a higher price as well. Are there writing samples for the abovementioned various flexible nib sizes? This information was not available here or RB’s website. Thanks Brian for your attention on this matter. Really looking forward to hearing from you soon! Sorry, we don’t have examples of each tip size. But you should expect the unflexed writing line to be the same as Western tip sizes. Thanks! HiBrian, I was wondering if you’re still selling the Edison Collier Richard Binder pen? I’m interested in purchasing one . Yep! Email brian@edisonpen.com to inquire. Thanks! Are these still being offered?! I have become a bit of a flex addict and want one with all of my soul. This is fabulous news! I’m going to start saving up my pennies to get one. Are the flex nibs available for the #5 Mina as well, or only the #6 pens? Sorry, the flex nibs are #6 size only. So they will fit any pen except the Mina and Pearlette. Thanks! Hello! Are these still available? I owned a Pelikan m400 pen with extra fine nib. I love the pen but the nib is too wet and thick. Will you be able to customize the nib to my preference? If so, how much will you charge for it? Thank you. Hi Dorothy. Thanks for thinking of us, but we only do nib adjustments on Edison Pens. I live in Europe. If I want to buy an Edison Collier with a customized nib from Richard Binder, can I order it at a dealer (in the UK for example) or do I have to order it directly from you? I think it would be less expensive to buy in UK or NL because of the custom taxes. I’m sorry, but with Richard Binder flex nibs, our agreement with Richard is to only sell them equipped on Signature Line pens. After all, we don’t want to be a “retailer” of his products. If we did, then our volume would certainly exceed what Richard would want to do for us. Consider that he is retired and is basically doing me a favor as a friend. We consider ourselves lucky to get the Binder flex nibs that we do. But perhaps more importantly, our margins on these nibs are very very poor. It’s only profitable for us to sell these equipped on Signature Line pens. Is it possible to request a duopoint nib with the full flex? Sure thing! Just reach out! This sounds really interesting. Sorry if this sounds stupid but how do I choose/order a pen with such a nib?